Speaking of fresh, premium sandwiches, the brand O'Briens Irish Sandwich is surely the first thing that pops into my mind. I'm sure this prominent brand needs no further introduction. With the presence of 21 outlets nationwide, it is easily accessible to anyone who craves for a healthy wholesome meal. This lifestyle cafe adopts a healthy, fresh and made-to-order concept where diners can pick their favourite ingredients from the bar and choose the bread for their sandwiches. Sandwiches and salads are prepared in front of customers, hence don't worry about the food hygiene and professional handling. And the best part is, everything here is about mixing and matching. an epitome of Ireland, the country of origin of O'Briens. For the bread, you can choose Wrappo (Light flour tortilla wraps), traditional White Bread, fibrous Wholemeal Bread, herb-based Facaccia Shambo, Italian Ciabatta, Multigrain Ciabatta and more. I personally prefer something with greater texture, hence the multigrain ciabatta is the right choice for me. The main filling here range from poultry, seafood and red meat to vegetarian, cheese and eggs. After picking the filling, you can choose up to 3 types of salad. They actually have loads of vegetables on the bar, but I didn't manage to capture them all, so please refer to the list below. Interestingly, the sauces are uniquely prepared with secret recipes, hence they are delightfully lighter and healthier than the usual mayonnaise. Next....it's time for me to make my very own sandwich! The sandwich maker gets serious when applying the guacamole (Avocade spread) onto the foccacia bread, before adding cucumber, sundried tomatoes and olives into the hearty combination. .....but after that, a very happy (yet unglam) face is caught on camera! Now can you see how much fun is it to craft your very own sandwich? Tadaa! Here's my Smoked Salmon Sandwich, served with light and crispy potato chips. The unsalted chips are ultra thin and light but flavourful enough to beat the rest of its unhealthy counterparts. Let's check out the rest of the sandwiches made by my partners in crime. Triple-deckers are amongst the house specialty handcrafted sandwiches and also the bestsellers here. A platter of this is sufficient for a big eater, and also suitable for group sharing if you'd love to try more varieties. Apart from hot toasted sandwiches and cold sandwiches, you can also try the thin tortilla skin which wraps the premium fillings around and is dressed with assorted fresh salads and sauce. A great option if you are not a bread person. 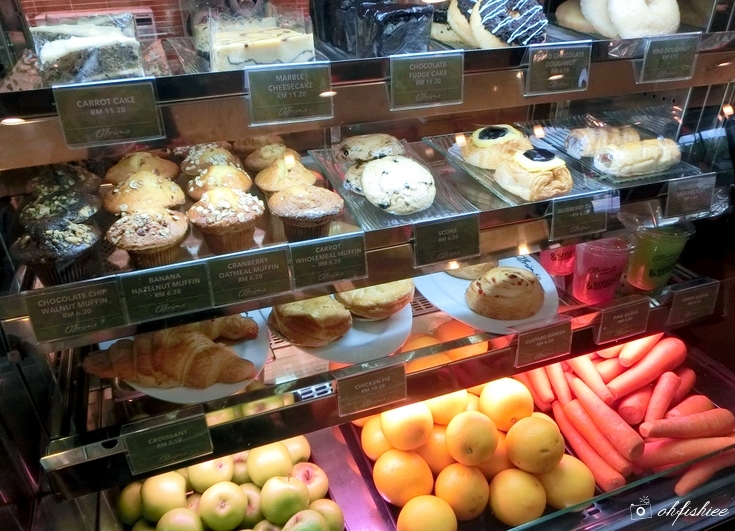 Well, O'Briens is already well-known for its hand-cut sandwiches, salads and wrappos, but many do not know that they're also good at gourmet coffees (Freshly grounded Arabica and Robusta), freshly squeezed juices, cakes and Irish snacks. Another notable offering in O'Briens is the freshly squeezed juices, which are made of up to 3 types of real fruits, without any additional sugar. For a quick boost of Vitamin C, they even have a special machine to perform the juicing right in front of customers using 8 to 10 pieces of oranges. 1. Concept wise, I love the healthy sandwiches and juices which are absolutely free from unnecessary sugar and fats. And I can be assured of the quality as they practise open-bar concept for the food preparation. 2. The varieties are amazingly wide, so surely you'd find something you love from the preset menu, or you can customize your own according to your preference. 3. Reason of visit: Fresh, natural and guilt-free food. or you can contact 1300-30-3000 for delivery.